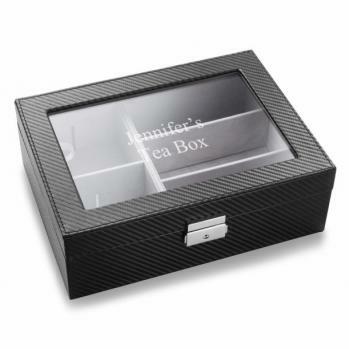 DETAILS: Made using a stylish, synthetic material, this personalized tea box is the perfect Mother's Day gift for someone who loves tea in all of its forms, particularly since its slots can be adjusted as needed to suit their contents. Better still, its top can accommodate 2 lines up to 20 characters, thus making it a personalized gift. MEASUREMENTS: 10 3/8" x 7 3/4" x 3 1/2"